Enabling GRC activities with technology can be difficult. There is no “silver bullet.” There is no single piece of software that “does GRC.” Many organizations integrate a number of technologies to achieve their goals. To this end, many organizations find that integration can be difficult and expensive — and the bane of the CIO’s existence. In this session, Co-Chair of the GRC-XML project, Said Tabet, will present an update on the GRC-XML project. Important milestones have been achieved including the use of GRC-XML in several regulatory initiatives around the globe. One last step before we send your slide deck! 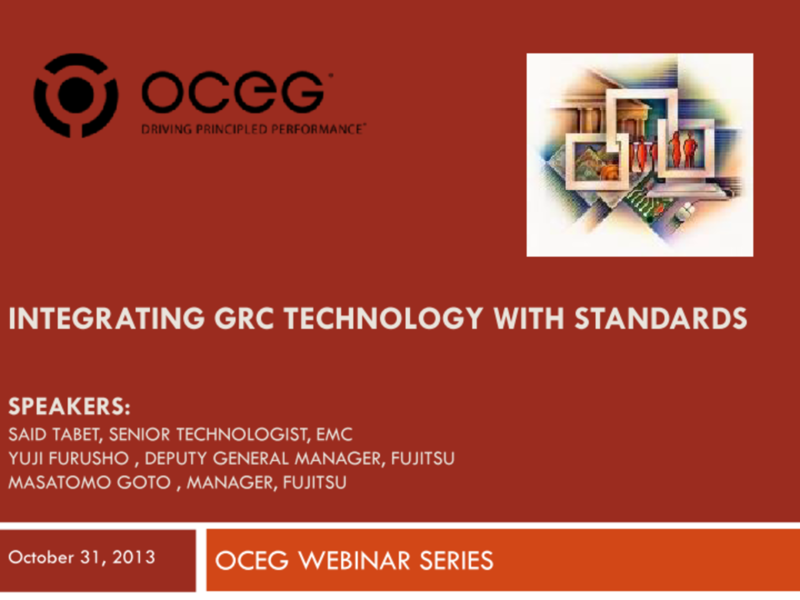 We have emailed instructions to access Integrating GRC Technology with Standards Slide Deck to . Make sure the email arrives in your inbox: either add "support@oceg.org" as a safe sender to your email platform, or if you use Gmail, drag our email into your Primary tab.